Cakes & Heavies: the lists await you!! Dinner Bookings: We are now taking bookings for the dinner held on Saturday evening – £25 per person. Menu is at the back of Church See one of the priests today! Bistro Menus: are also available from this weekend. 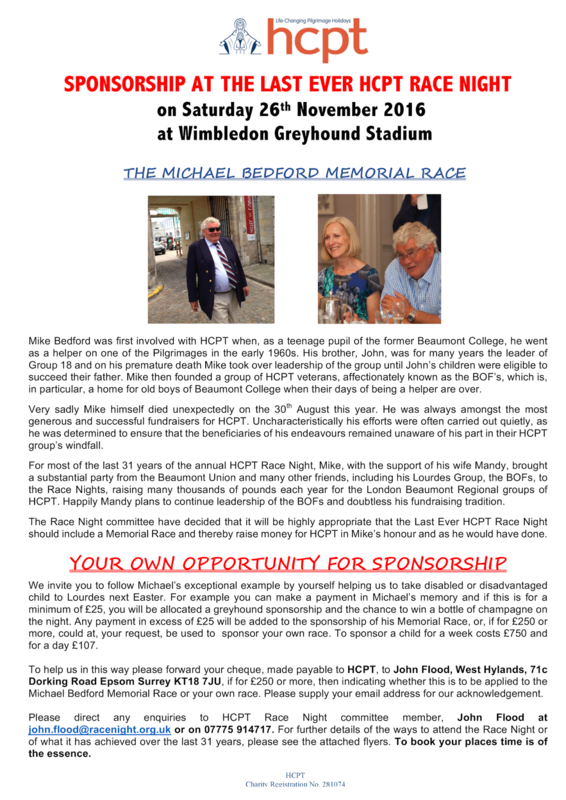 Please return your order to the presbytery by no later than Wednesday 23rd. Donations Needed - Good Quality items only please: Good-as-new, toys, jewellery, fancy goods, religious articles, your homemade crafts & jams. No books, electrical or clothes items. Only bring in items which are new/almost new please! Monetary Donations welcome! if you would rather make a cash donation – these are grateful received too! Annual Blessing of the Graves - 3pm today: at Streatham Park Cemetery, Rowan Rd. Please come prepared for wet weather & slippery conditions underfoot. Darkness falls quickly at this time of year and the cemetery closes at 4pm so the blessings may have to be short. Remembrance Sunday - 11am Mass The music will be: Ordinary: Missa pro defunctis (Giovanni Francesco Anerio) & Communion: Versa est in luctum (Jose de Torres y Martinez Bravo) and is provided by Cantores Missae under the direction of Mr Charles Finch. As it is Remembrance Sunday, this Mass is offered for all those who gave their lives in WW1 and WW2 and subsequent conflicts. At this Mass we will also remember those who have died in our parish over the past year. First Communion Applications - closing soon: If you haven’t returned your form for the FHC programme please do so as soon as possible. We hope to kick off the programme in December so the application window will close soon. Red Boxes: The end of the financial year for the APF Red boxes is 31st Dec so if you have a box at home & it hasn’t been emptied this year, please bring it to one of the weekend Masses & hand to our priests. We will endeavour to empty, count and return the box to you ASAP (please check the table in the porch for your box). Can you please ensure your name is written on the white label at the bottom so we know who to return it to! African & Caribbean Meeting: There will a brief meeting after the 9.30am Mass next Sunday (20th) to discuss the forthcoming bazaar. Silver Jubilee of Fr Francis Lynch (Dominic's brother & Fr Tom's uncle): Twenty five years ago, fr Francis said his first Mass here at St Bede’s as a newly ordained priest. He will celebrate his Jubilee with Mass on Wed 30th Nov at 6.30pm in his parish, St Gertrude (1 Debnams Rd, Rotherhithe New Rd, SE16 2BB) and there will be a parish celebration on Sunday 3rd December at 6.30pm. 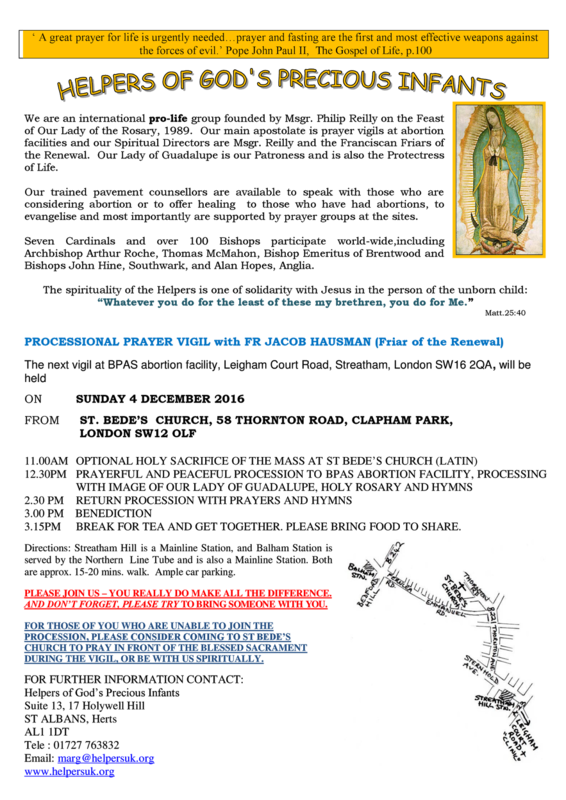 Helpers of God's Precious Infants - Streatham Vigil - 4th December: The next vigil at BPAS in Leigham Court Road will take place on Sunday 4th December leaving from St Bede’s – see the poster at the back of Church for more information. 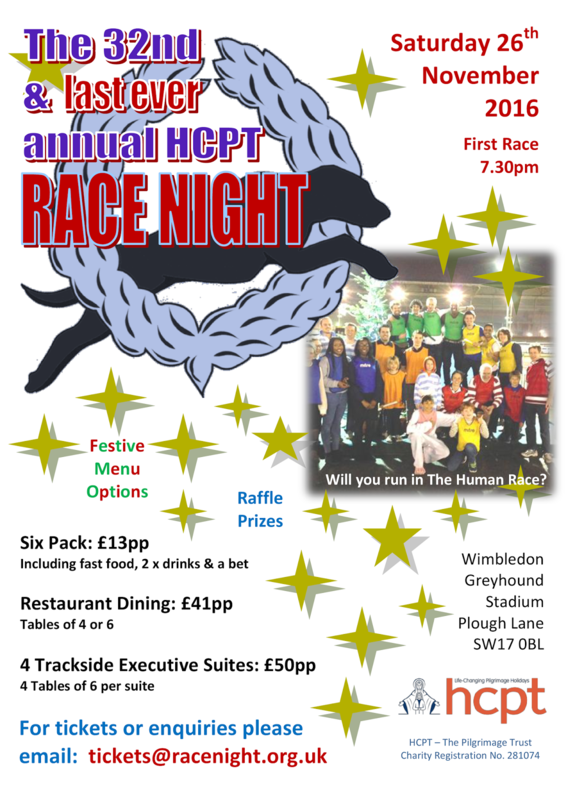 HCPT Fundraising Race Night - Saturday 26th Nov: The 32nd & last Race night to be held at Wimbledon Stadium (before it is redeveloped) will be held on Saturday 26th November. There is also an sponsorship form if you would like to sponsor this or future events. See the posters at the back of Church.